The alpine 'Maiden Lily' of Japan. Known as "Otome-Yuri", the flaring, open trumpet type flowers are a clear and delicate pink rarely seen even in today's "modern" hybrids. Purebred bulbs of Lilium rubellum are not easy to cultivate and requires a very acidic soil that is well drained. Being an alpine lily that is covered with snow, it must be protected from winter rains in the garden. Best suited to a cool greenhouse we still remember the day our first blooms of Lilium rubellum opened from seed that was given us by the Ofuna Botanical Garden. 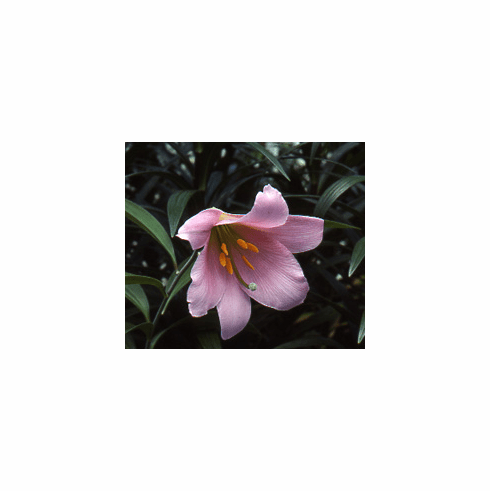 This lily produces the cleanest, most pure color of pink you will ever see. Photo inset #1 is of a bed of L. rubellum as grown by Edgar Kline at his Oregon nursery. Photo provided by Bill and Mary Hoffman. Photo inset #2 shows L. rubellum as grown and photographed by Gene Mirro. Copyright Gene Mirro, all rights reserved. Used with permission.